Above: The cover of Lydia's original Authentica African Imports mail order catalog. Above: Jack loved collecting antique American and European art depicting farming scenes, such as this much loved piece showing wheat scything. 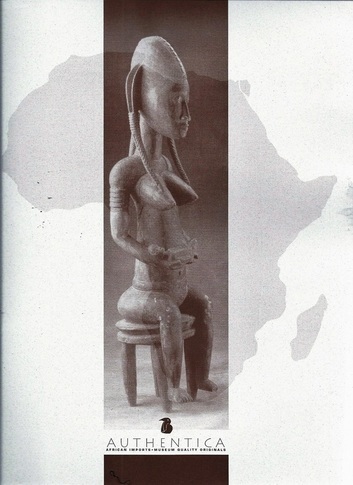 Jack and Lydia Clemmons are avid collectors of African and New England antiquities. The Clemmons Family Farm holds a collection of museum-quality African art from their travels on the African continent, and their former Authentica African Arts import business, which was the first African import mail order business in the United States. The art collection also includes New England antique farm tools and equipment- many of which are from the original farm’s house and barns which were built between the late 1700s and mid-1800s. 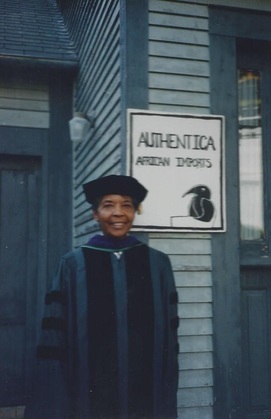 Above: Wearing her cap and gown from a ceremony celebrating her honorary Degree in Law (JD) awarded by the University of Vermont, Lydia stands in front of one of her first Authentica African Imports business signs at the Farm's historic blacksmith shop. Above: Watch the storytelling video, ​Farm2Art Block Printing, about one of the Clemmons family's earliest "farm2art" projects: intricate carving and printing with linoleum blocks in the 1970s! ​In addition to collecting art, both Jack and Lydia created it, blending their artistic talents with their work on the family farm and their careers in medicine. Lydia was a talented seamstress, creating many of the clothes her children wore. She also hand-stenciled beautiful designs on old farm tools, and practiced the fine culinary art of Southern cooking (Louisiana gumbo is one of her specialties!). Jack began drawing and doing photography when he was a very young child, and often worked with his five children to teach them how to make creative works, including beautiful prints from carved linoleum blocks, such as those featured in this video. LEARN ABOUT OUR FARM2ART PROGRAM!